So after three months of trying out love me beauty my final box finally fell through my letter box (actually missed the delivery and had to go all the way to the collection office, but you know)! 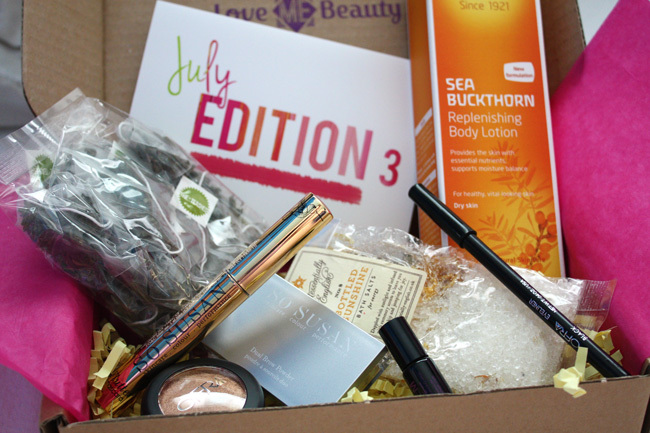 One bad thing about LBM (love me beauty) is how long it takes to reach you from selecting your box! For a time frame I selected my box on the 5th July and it got to me on the 18th, so that's a whole two weeks! You apply this to your roots of either your eyelashes or your brows once a day and within 2 weeks your lashes could look longer. I think I may test this one on my brows, bit worried about putting chemicals right near my eyes, plus my eyelashes are quite long anyway. It doesn't have a chemical small and applies clear. Full size version of this product would be £40! 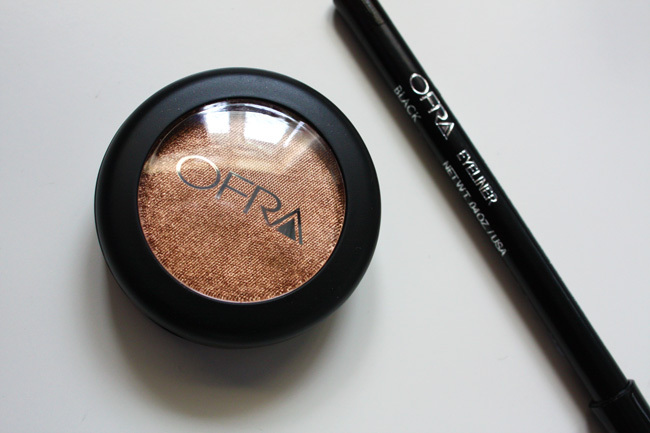 This months featured two products from OFRA, I've not heard of this brand before so was keen to try it out. 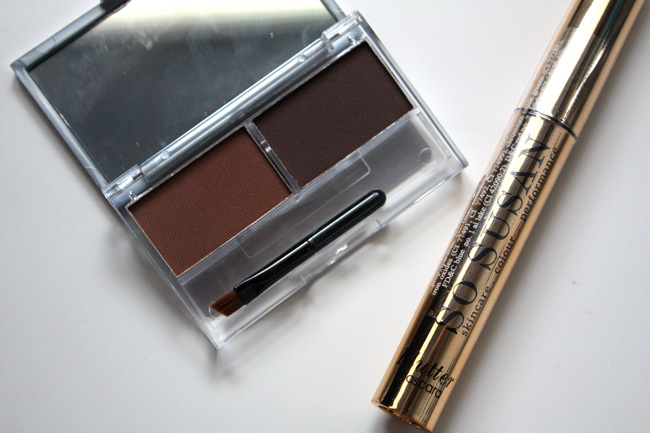 The eyeshadow I chose was gold rush which is a lovely bronze gold shade, perfect for blue eyed people like myself! It will really make the blue pop. The shade is part of their "diamonds are forever" collection, as the name suggests it has a pretty shimmer running through it. Pigmentation-wise I was really impressed! 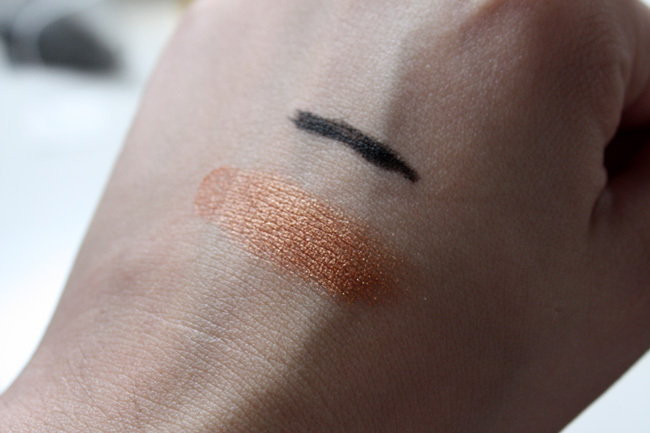 The swatch below shows just how much colour payoff it has. In the write up it says to apply with either a dry or wet brush, so I'm guessing with a wet brush this would look even more impressive! The eyeliner is your standard black liner, it claims to be waterproof so I'll test his out on my tight line and see how it holds up! Both products were full size and retail at £8.80 and £7.60. 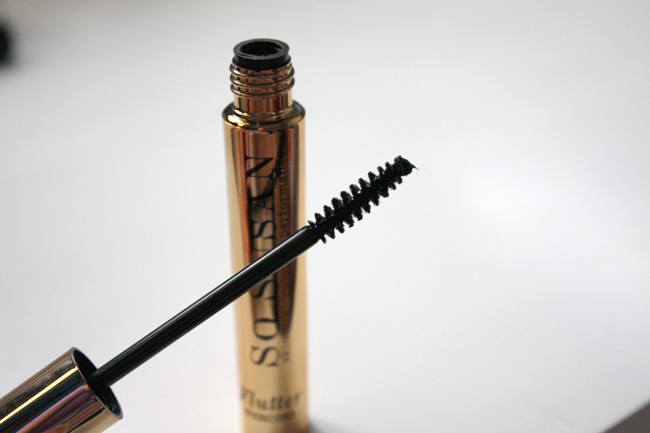 The second So Susan product I received was their flutter mascara. It retails at £14.95 so on the higher price scale of drugstore mascaras. 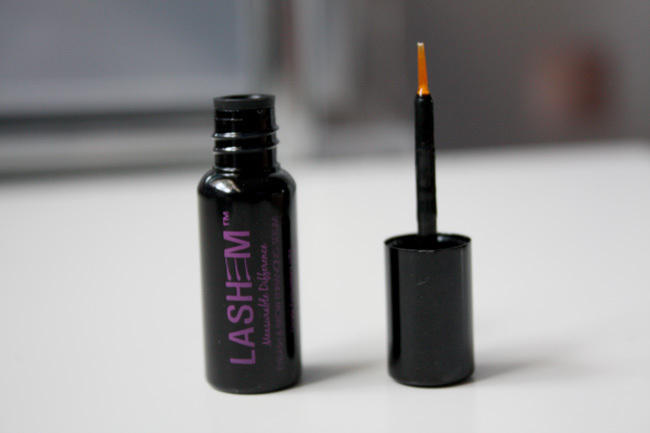 It claims to create the curviest, darkest lashes possible. Not something I've been able to test out, you'll see why in a minute. 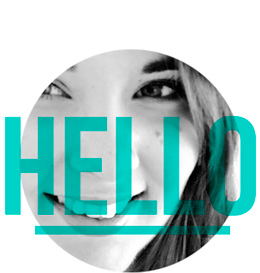 All I can say is that to me it smells like apples, which is a nice change from the potent smell some mascaras have. The brush head is quite small and has fibre bristles. I can only assume somehow the little brush scraping valve broke, so now I have one broken mascara! Not very good for a £15 mascara really! The final product on menu 3 was some tea bags, I'm a bit disappointed they came out of their packaging. It looked online that they're meant to come in a little mini starbucks take away kind of cup, but I received mine in a clear bag. I received Skinny tea, which is a green tea thats known for boost metabolism. I've never tired green tea before, hopefully I'll like them as I've got 20 bags to get through! I didn't know this but apparently the first 450 subscribers to pick their box got an extra item by weleda! I must have been quick! It's a full size product, which is great as you can never have too many body lotions. It smells lovely and fresh with a citrus-y lemon scent. It normally costs £15.95 so really impressed to have this to try out! I also received another extra, not sure why on this one though! Not complaining. 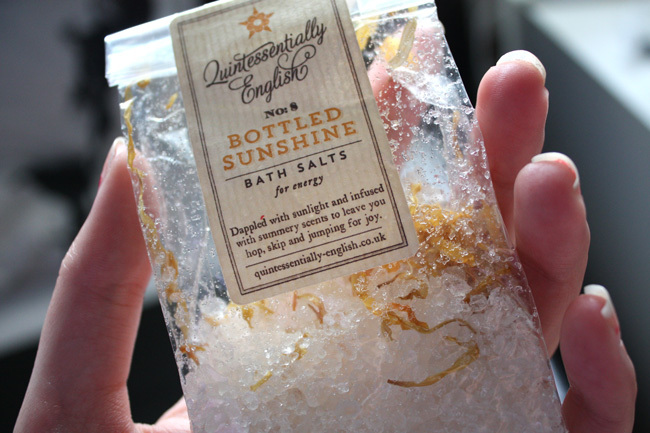 It's some bath salts from Quintessentially english, they smell citrusy too. So they'll be good for baths on the weekends when I'm feeling sleepy in the mornings. 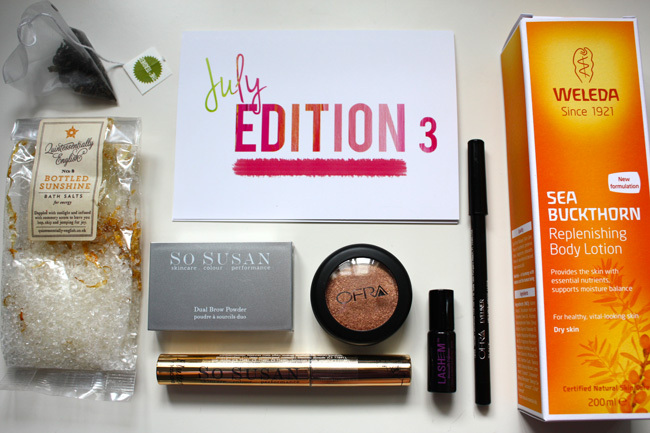 Overall I think I've been quite impressed with the Love me beauty boxes, but sadly I think I'll have to give them up. I'm trying to cut down my spending and as an existing beauty box subscriber I can't justify regularly receiving more than one box a month. I think so far this box has been my favourite out of all three. Previous box posts can be found here (May and June). Which option did you chose this month? My mascara did exactly the same! Obviously a fault with them! I was so scared it was going to drip off and I had light blue trousers on eeeeek! Must be a dodgy batch! I've got a replacement coming so hopefully that one wont do the same thing! My mascara did the same thing as well.. I wrote to LOVEmeBEAUTY so I am just waiting to hear for their reply. So I just recently got my first LOVEmeBEAUTY box in the mail today which I was really pleased with, but at the same time a bit confused. After seeing the amount of products you got in your box, I am baffled in why I got a small amount of things in my box. I have now seen your box, and I have seen others in Instagram and YouTube that they have up to 6 or 8 products in their box and I only got 4. Which got me confused. So my question is, do you select the products you want with the points that is given to you, or do you choose to get a surprise box sent to you every month??? I think LoveMeBeauty now does their boxes slightly different. (I'm no longer subscribed so not sure) but when I was I got to pick between three different boxes. I could see what I'd get before I received it and I picked the one I wanted to receive. I think now you select individual products to make up your box so this may be the reason why you don't get as many products anymore.